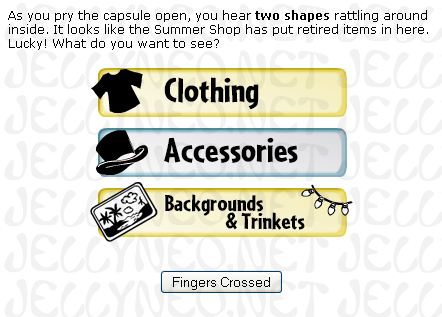 On June 11, 2014, all of the existing Mystery Capsules were retired from the NC Mall, and in their place, new capsules began to be released that focused more on exclusive items and older re-releases. 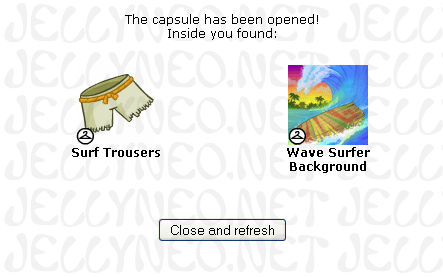 When opening a capsule that gives out re-releases, you'll have the option to select what type of NC item you would like to receive, such as Clothing, Accessories, or Backgrounds & Trinkets. The message at the top talking about shapes rattling around inside will indicate how many items you'll receive, which depends on the capsule. You can receive one item per category, so in some cases, you'll need to select multiple categories. And after confirming, you'll get your shiny new/old re-released Neocash items! Typically, a gift box mystery capsule is released towards the end of the month and is on sale for a limited amount of time. These are popular items, so they're kept limited. They're used heavily in trading for other NC items since they provide guaranteed gift boxes each time they're opened (which are needed for trading NC items). Opening a gift box mystery capsule will award a random NC item currently for sale in the Mall, along with at least two (sometimes more) gift boxes. The description of the capsule will specify how many boxes you can expect. Since what's for sale in the Mall is almost always changing, we do not provide a rotating list of what's possible. You can view all of the gift box mystery capsules by visiting our Item Database. This particular link sorts them by their release date, starting with the most recently available capsule. The new limited edition item capsules will typically have around 9 exclusive items that you can win from opening the capsules. They no longer award a random NC item as the old style capsules did. (But, opening an old style capsule will still function as it did!) You can view the new style capsules in the table below, or visit the Item Database for a complete list including the old style capsules.